There are still three months left this year and four features yet to be released by Universal Pictures, and the company has already reached a milestone in the North American box office. Universal announced yesterday (September 25, 2012) that this has been the studio’s best year in its 100 year-long history, earning 1.128 billion dollars in the domestic box office, and surpassing the 1.127 billion mark set in 2008. Ted, Snow White and the Huntsman, and Dr. Seuss’ The Lorax were responsible for the studio’s huge success; however, there are four other films yet to be released later this year: Pitch Perfect, which opens next week on October 5th. The Man With the Iron Fists, set for a November 2nd release. This Is 40, opening December 21st. 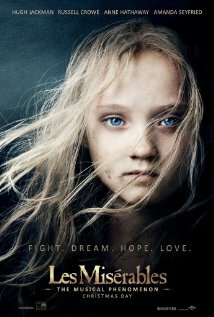 And the much anticipated, Oscar-buzz musical Les Misérables, expected to come out on Christmas day. I think it’s incredible to see how much the studio will earn by the time these four films are released. Les Misérables will definitely make more of an impact. The musical, directed by Academy Award winning director Tom Hooper (The King’s Speech) and starring an amazing cast that includes Anne Hathaway, Hugh Jackman, and Russell Crowe, has been highly anticipated by both critics and moviegoers alike. The trailer gave me goose bumps and I'm anxiously looking forward to it. An interesting fact I’d like to share before I get off topic, is that it’s a game-changer because the music was actually performed live instead of being recorded on a studio months prior to shooting. “It’s so much more powerful. You have complete freedom and control.” Amanda Seyfried said about singing while acting during an interview. Click on this link to view the featurette and learn more about the film. Some movies being distributed by the studio next year include The Fast and the Furious 6, Gravity, Alfonso Cuarón’s latest project since his Academy Award nominated film Children of Men (2006), and Oblivion, starring Tom Cruise and Morgan Freeman. I am certain the studio will keep leaving a legacy and I am excited to watch more entertaining and memorable films for many years to come.